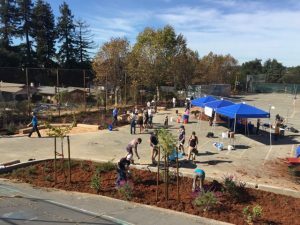 On a sunny Saturday morning in Oakland, The Watershed Project led the Melrose Leadership Academy school community in planting a new swale and natural play area on the edge of their large paved playground. TWP partnered with the Trust for Public Land on this greening project that removed large swaths of asphalt to create natural play spaces. 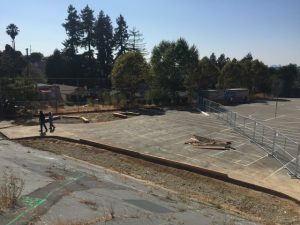 Contractors removed the pavement, graded the earth and installed the curbs and log benches, and The Watershed Project worked with the school community to plant the newly created spaces with native plants and trees. Stormwater management was one driver of the project, but Melrose students will feel the benefit of the trees, plants and shade. On the community workday, kids formed a bucket brigade to move two large piles of mulch into the newly planted areas that arose from the asphalt. A father showed his son how to hammer a nail into a tree stake, while a graduate of The Watershed Project’s Green Collar Corps patiently taught youngsters how to saw. Parents, students, teachers, and administrators came together to build an experiment in urban greening—a small oasis in the midst of a paved landscape that filters urban runoff, provides shade for the playground, and offers habitat for pollinators. Having plants in a playground setting will take some getting used to and will require a stewardship plan. In fact, after the area was planted, students wanted to know if they were allowed to go into the swale, to retrieve a ball or just to play. Often, on school campuses, the only green spaces are on the edge of the school and are certainly not accessible. One approach to protecting natural areas is to fence them off, but what better place to educate students, staff, and parents about how to take care of a bioswale than on a school campus? 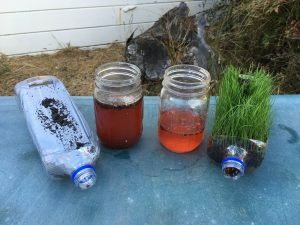 The Watershed Project’s Wild Green Schools program has students engage in bioswale design and explore urban runoff and the pollutants found in stormwater that bioswales are designed to filter out of the environment. At Melrose, a group of 6th graders tested how plants in a bioswale filter stormwater using mini bioswale models planted with real plants. Complete with a deeper understanding and appreciation for the work that the bioswale is doing for the school community, these students will lead by example in caring for the plants. They will be joined by a parent-led Green Team and further supported by the Food Corps gardening program staff. Ultimately, the success of projects such as this depends on establishing connections and building positive relationships. The Watershed Project acts as a bridge between the project funder, the contractor, the school district’s maintenance staff, the Melrose school community, and the natural environment. A spirit of willingness to adapt, change, and grow with the new landscapes will make Melrose a more resilient school community.